After the sophistication of “How a Mosquito Operates,” I was a bit disappointed that Winsor McCay’s next animation film started off with another live-action wraparound story, which is essentially the same as that for “Little Nemo:” his friends bet him that he can’t animate a dinosaur. Apparently he chose a dinosaur as a subject because people had accused him of working from photographs to make the mosquito. But, once Gertie emerged from her cave, all was forgiven – she is the most lovable and fun of all the characters he created for these movies so far. The film was originally made to be shown without the wraparound; McCay showed it as part of live performances, and he would give Gertie the instructions that we read today on the intertitles, and Gertie would appear to respond to him. 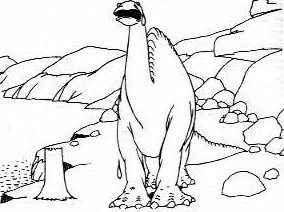 Gertie is a bit antiquated, being a Brontosaurus (a type of dinosaur we now know never existed), but that doesn’t really make a difference for cartoon purposes, and McCay gets around the scientific objection that their mouths were too small to feed their stomachs by having Gertie devour an entire tree in one gulp. Happily, she’s here to stay, the movie has been preserved by the National Film Registry.